I’ve been wishing upon a star for as long as I can remember, and now my dream is finally coming true! Who knew a cricket in a top hat would give such great advice? Yet thanks to him, I’ll be able to hang out with all types of creatures in unique outfits as I gallivant around the Walt Disney World resort for a little while longer! Only this time, I’ll be getting paid to do it! I am super proud to announce that after year of dreaming and wishing, I have accepted a role as a merchandise cast member for the fall 2017 Disney College Program! Ever since discovering this program over five years ago, it’s all I have been thinking about and I can’t believe that I’m actually going to be a part of it! For those of you who aren’t familiar with it, don’t sweat it, that’s what I’m here to explain! The Disney College Program is something that both Walt Disney World and Disneyland have been offering students for years. It allows anyone enrolled as a part-time or full-time student to take a semester off and work for the company at any of the theme parks, restaurants, or resorts. While on the program, they are provided housing with other CPs, as well as the opportunity to take classes taught by Disney in a number of fields. Some colleges even accept these as credit for their university! The program has been known to create countless memories and connect people from all over the world, while gaining experience in such a unique industry! I discovered this program long before looking into majors and schools, and I do believe that my desire to work there has lead me down the path that I am on today. And I am SUPER lucky because as each semester passes, the competition becomes even more intense. Thousands of people apply each year, and only a very small percentage move on to the next round. In the application process, there are three steps to complete before the possibility of acceptance is even visible. As each step is completed, less and less move forward, until acceptances are finally sent out. Because of this vigorous application process, I have been very nervous about if I would ever get the chance to make this dream come true. Sure, I could always apply for a part time job there, but the college program offers so much more to its participants than just a job, and that was incredibly important to me. So important that I sped up my application process by a semester. Since my sophomore year of high school, I got this idea in my mind that I would participate in this program the spring semester of my sophomore year in college. It would give me the chance to get used to my school for a year, as well as not miss out on most of the important fall events that come with welcome week and football games. I wouldn’t have to work any major holidays, yet it would come early enough in my college career to get my foot in the door with internships. Unfortunately, a higher power had other plans for me. As I previously mentioned, the application process is intense, and I knew I would have to give it my all in order to get this opportunity. So being the planner I am, I planned to go through the application process one semester early to get a feel for how it would go when I was serious about doing this. Well that plan backfired in the best way possible because after filling out the application and submitting it, I heard back 56 minutes later with an invitation to the next step, a web based interview. I was shocked to have heard so soon, but I knew I had to at least check out the WBI because I have read that it is the hardest part of the application process. This is because the company is looking for a certain type of person to work for them and this is the step that weeds out most of the competition. Laptop in hand, I logged in and answered everything truly, and it paid off. I was immediately redirected to a screen inviting me to move on to the final step, the step only about 30% of applicants make it to, the phone interview. I was amazed how lucky I was to make it this far, but also super stressed out because none of this was in my plan. I was excited to come back to UCF in the fall and had just finished finalizing my plans for next year. But now there was this new “what-if” hanging in the air. I spent the next week entangled in my thoughts as I tried to wrap my mind around how all of this was happening. Both excitement and stress flooded through my mind and it was a whirlwind of emotions. Yet I went into that phone interview super nervous yet super prepared to handle whatever was thrown at me. As I stuttered through my conversation with my interviewer, Kathy, my heart was beating out of my chest. I didn’t know what to think. Yet I did inform her on my happy crisis and she advised me to not set anything in stone. Yes, it might seem like doing something six months early is a lot, but in the field I want to go in, the earlier I get started, the better. She told me to take every opportunity that is thrown at me, because someday, they are going to stop and no one wants to regret missing out on anything. That advice set a fire in my heart and cleared up all my stress and I knew that if I were accepted, it would be a no brainer to take the role, regardless of the time frame it fell in. Yet that clarification came with a newfound burst of excitement. Unfortunately, after my phone interview ended, it was time to play the waiting game. I waited two weeks, three hours, and seventeen minutes (but who’s counting?) before getting my email with my results enclosed inside. At 12:24 pm on Tuesday, February 14th, I heard my phone vibrate, and my heart skipped a beat, as it always does when I get an email notification, and there. it. was. That is about as far as I read before absolutely loosing my mind. I immediately texted everyone I could think of and began crying (and I don’t cry often so you know this is the real deal.) After calming down for a split second, I checked my role and found out I was blessed with merchandise. It wasn’t my top choice, but it was pretty high up there and I’m just thankful I didn’t get custodial or quick service food & beverage. It’s incredible how many amazing opportunities I’ve been blessed with since starting college, and this is only the beginning! So it looks like you have a new journey to follow me on, huh? Lucky for you, this is going to be an exciting one! So get ready, because in 165 days, this blog is going to get a heck of a lot more magical! Thank you all for the endless support, and I can’t wait to see where this takes me. 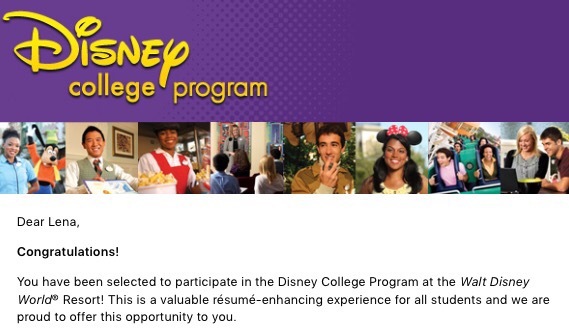 I’M GOING TO DISNEY WORLD!! !